I love making bread at home and this whole wheat honey version is as simple to make as any homemade flatbread with a touch more flavor. You can easily double this recipe and store in the freezer for a couple of months too, which I love for busier times in life. I decided to make this a beautiful, herby, healthy and filling meal by adding thick Greek yogurt and roasted chickpeas for the whole meal win. I ate this for lunch and leftovers for a lighter dinner the next day with some added greens, either one was enough food for me! Adding herbs to our meals is an easy way to make a bland meal taste better but is also super healthy for us. Fresh herbs are full of nutrients that are overlooked often but start adding them, they are super good for us! It’s easy to pick up a bunch of parsley and use it in your cooking but also to garnish so many dishes, it goes a long way for that little bunch of green goodness. 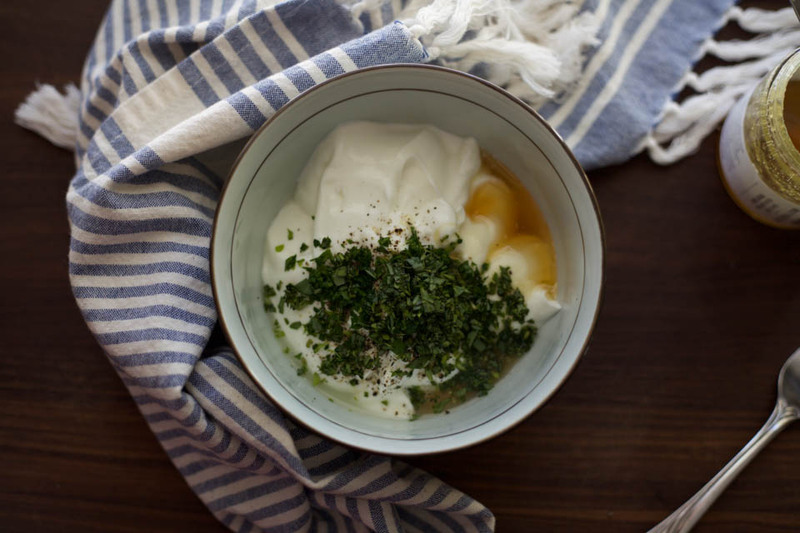 Like this yogurt, I added fresh tarragon and parsley and kept a touch of it to garnish the top of the chickpeas for an even more fresh flavor. So my new year will be full of more fresh herbs, homemade breads, and all around goodness! Check out this recipe on Portland’s ABC’S KATU ch2. AM Northwest next week on Wednesday January 18th from 9-10am with Helen and I! Add yeast and 1 teaspoons honey to warm water, let stand for 5 minutes until bubbly. Once bubbly add 2 teaspoons honey, 1/4 cup water, and 2 tablespoons olive oil to yeast, use a fork to combine well. Place flour and 1/2 teaspoon of salt in a stand mixer fitted with dough hook attachment. Add water/yeast mixture and knead on medium speed for 5-7 minutes until dough in pulling off sides of mixer. Cover dough and let rest for 1 hour or until doubled in size. It is a slightly sticky dough. TIP: warm your oven to lowest setting, turn off, and place bowl in oven to double in size. Once dough is doubled, preheat oven to 400 degrees to roast garbanzo beans. Once doubled, place dough on lightly floured counter. Gently deflate dough by pressing with your fingers. Cover and allow to rest for an 30 minutes on counter. Garbanzos: While dough rests work on garbanzos and yogurt. Place garbanzo beans, 1 tablespoon olive oil, 1/4 teaspoon salt, paprika, and 1/4 teaspoon fresh ground pepper on a parchment lined sheet pan, toss together to combine. Place in oven and roast until crispy for about 20 minutes. Yogurt: Add 1 teaspoon honey, 2 teaspoons parsley, tarragon, and fresh lime juice, use a large fork to combine well. Once dough rests 30 minutes, use a bench scraper or pizza cutter to cut the dough into 4 even pieces. On a lightly floured surface, roll out to about 1/4 inch thick in 6 inch circles. Heat a large skillet or grill over medium heat. Lightly brush the flatbread with olive oil, cook on each side for 3 minutes in skillet. 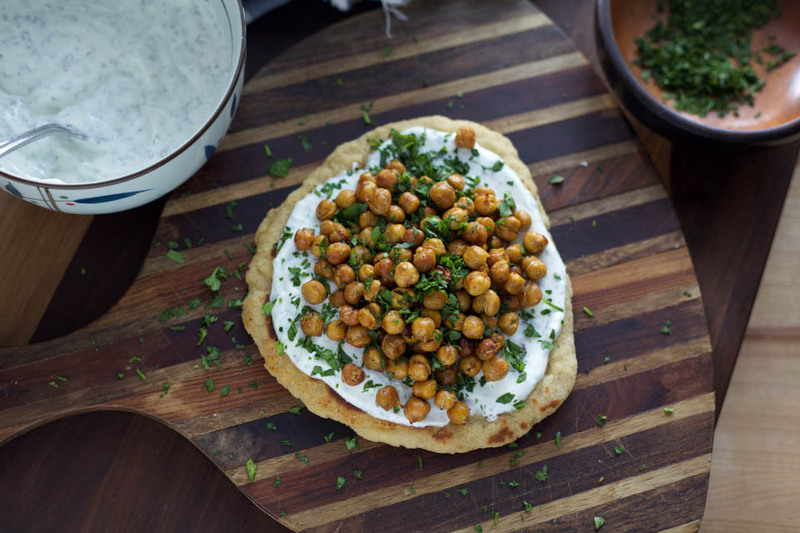 Assemble flatbread: Divide yogurt evenly among warm flatbread, top with 1/2 cup roasted chickpeas, and sprinkle with fresh herbs and a squeeze of fresh lemon or lime. 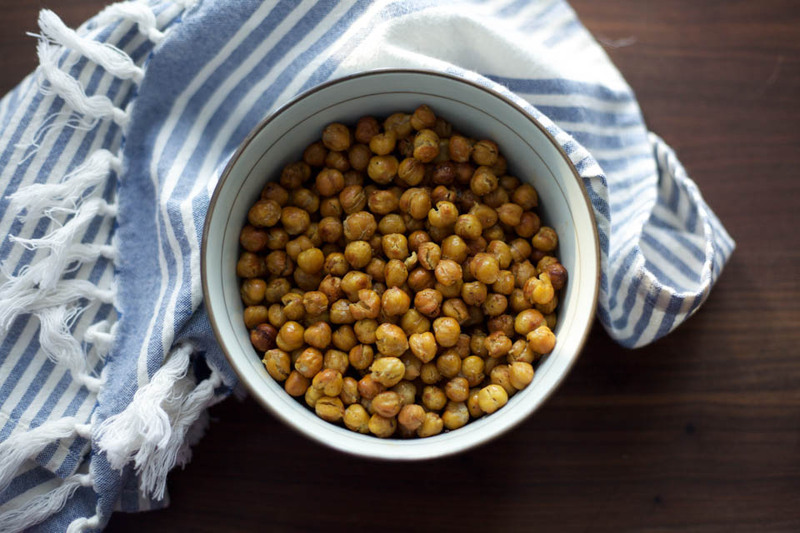 Store leftover yogurt and chickpeas in an airtight container for up to 3 days. 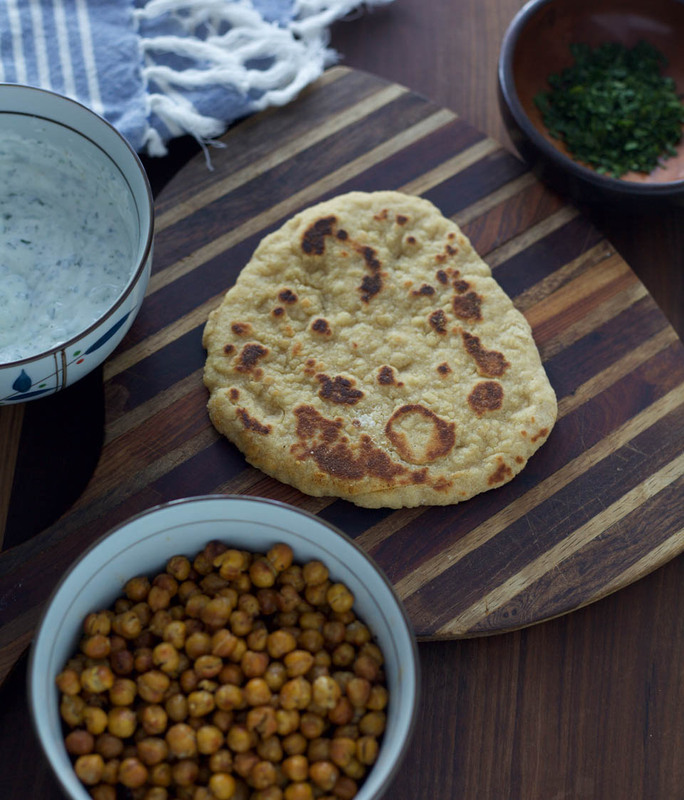 Store flatbread on counter in an airtight container or bag. Place in fridge for up to 1 week, or freezer for up to 2 months. I love homemade bread too!! There is something so satisfying about making bread by hand. 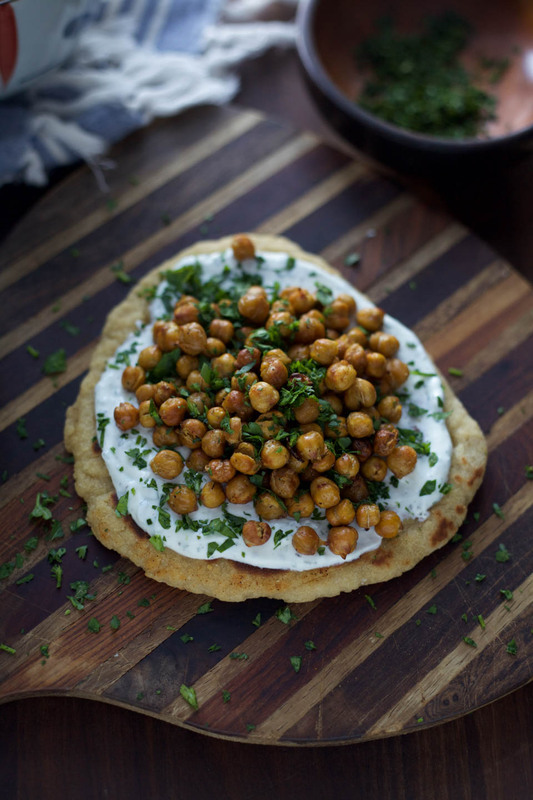 This looks just wonderful and I love the roasted chickpeas too! Totally, thank you so much! I love that the bread can be frozen! I also love chickpeas! Can’t wait to try this!